“You’ll get through this. It won’t be painless. In the meantime don’t be foolish or naïve. How do you navigate life in the pit? It’s deep, dark, dirty and cold. Physically, you’re hungry, thirsty and exhausted. Emotionally, you’re anguished, afraid and full of regrets. You have no idea when, or even if, you’ll get out. The pit is a difficult place to find yourself, as it is often visited during some seasons of life. So you find yourself in a pit. What’s next? Where’s help going to come from? 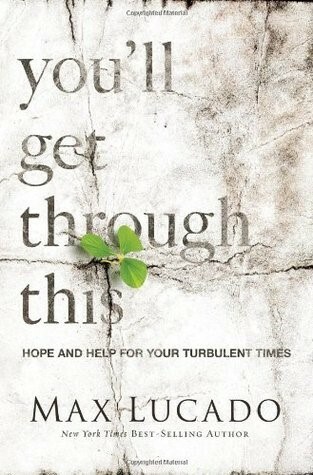 Pastor and New York Times best-selling author Max Lucado addresses this very topic in his 2013 book You’ll Get Through This: Hope and Help for Your Turbulent Times. Lucado stated in an interview, that based on his ministry experience, one in every five people he sees on a regular basis is going through some kind of struggle. Based on the book of Genesis, Lucado explores Joseph’s life in a captivating story-telling format with compassion, insight and humor. Insightful questions for reflection are included for personal and small group study. Betrayed and tossed in a pit by his brothers, Joseph was sold into slavery, punished for doing the right thing, and endured a long imprisonment. Regardless of the circumstance, Joseph acknowledged God’s presence and trusted that He had a plan. God is at work whether we see it or not. We tend to focus on the day to day circumstances but He sees the big picture. We must wait and allow Him to complete His plan. God works on His timetable, not ours. God uses our difficult circumstances to help us become the person He intends us to be. God is a God of redemption. What Satan intends for evil, God redeems for good. God takes our pain and is able to shape it and put it to use for His plans and purpose. We must trust Him. While we do our part to act and respond in a godly way, we must trust Him to do what we can’t. Regardless of the pit you find yourself in, there is hope. Whatever “this” is – a health issue, financial crisis, broken relationship or wayward child, be reminded that you will get through it. God is next to us in the pit helping, supporting and teaching life lessons.